New legislation to regulate oil exploration projects will be addressed when Parliament resumes in November. “The government has completed the preparation of a new Petroleum Act and a suite of regulations designed to guide and govern oil exploration in The Bahamas as an integral part of the recently announced National Energy Policy,” Minister for the Environment and Housing Kenred Dorsett (left) told the media, October 8, at the Diplomatic Lounge of the Lynden Pindling International Airport. The new legislative regime aims to ensure safe measures for oil exploration to take place in The Bahamas. 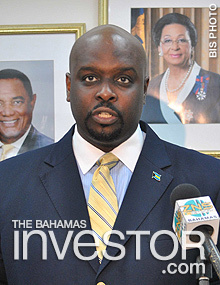 “In the meantime, it should be clearly understood that the new legislative regime will ensure that exploration for oil in The Bahamas will be undertaken in a safe and environmentally responsible manner, consistent with international standards, best practices and the most up-to-date risk management, health and safety protocols,” added the Minister. Minister Dorsett said that in the longer term, oil exploration could vastly increase the wealth of the nation through the creation of a flourishing new industrial sector and a sovereign wealth fund. “But first things first: it’s obviously important that we not count our chickens before they are hatched. That’s why it is so important that we put in place a new, modernized, up-to-date legislative framework, of the kind I am foreshadowing today, one that will enable us to find out, through licensed and properly regulated exploration, just what we have in the way of petroleum resources,” said Minister Dorsett. Minister Dorsett said that the Bahamian people should be rest assured, that the government remains resolute to its commitment to actualizing those objectives.